Evie Ladin was/is a member of the sadly missed (at least by me) and hugely talented 'Stairwell Sisters.' The was/is that the observant will have noticed above was inserted because I still cling to the hope that they will record again, however unlikely. Sadly they are another case of the huge talent contained within the confines of that band far outweighing 'Joe Publics' musical taste. If you want to hear how a team of five talented women can express and update 'old timey' music, blending their own originals with trad songs in such a way that you can't tell the difference, look no further than the three five star albums they released in their existence. Anyway, on to this album and it's a real delight to report that Evie, who was a huge influence on the musical direction the 'Sisters' took, is a gifted banjoist and talented dancer. That dancing provides much of the percussion on this recording on which she has developed and updated the 'old timeyness' in her songs for the modern age, even at times including echoes of jazz. This is her second album that carries the suffix, 'Band,' although perhaps 'Trio' would be more accurate, with Evie taking all lead vocals, banjo, some guitar and 'body music.' Keith Terry is on backup vocals, bass, percussion and body music, with Erik Pearson on vocals, guitar, resophonic guitar, bass and gourd banjo. From that little lot you can tell that old timey is never far away but this is a genuine and highly skilled update thanks to Evie's extraordinary writing gifts and the trio's ability to all be working 'on the same page' when it comes down to their musical depictions. Evie is the possessor of vocal cords that can handle just about anything she throws at them, with an ability to generate deep emotions or a lightness of touch seemingly at will, even extending to a mellifluous, floating, late night jazziness on occasions. The album gets going with the excellent title track Jump The Fire a sparky upbeat jazzy folksy song with banjo, chunky percussion and Evie's manipulative vocals on a lovely light feeling tale. The tempo changes on the very next track, Cozy, with its banjo and bass intro on a much slower song with Evie's vocal supported by 'gospel' harmonies on a lovely warm feeling composition on which the sound is eventually widened with the inclusion of a melodic dobro. Have it all is a complete change, with a late night jazziness that just seems to wrap itself around the listener with nice acoustic guitar, gentle bass and percussion with Evie's vocal at it's manipulative, expressive best. It is a song that name checks a variety of styles and artists without ever losing its thread. On Walking In A Straight Line there is a chunky bass and percussion intro on a song of indeterminate genre, with Evie experimenting with her vocal and song style as are the band who support her well with their manipulative harmonies and understanding of what is required. The percussion is courtesy of a variety of handclaps and stomps, something that doesn't easily transfer to the written word but helps give the album its originality and diversity. Finally, Drinking About You is a lovely steel guitar driven and excellent mid tempo country song that despite the sparseness of the instrumentation has an old 'western swing' feel as it rolls amiably along. 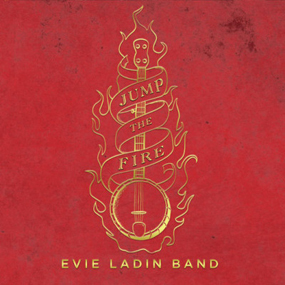 It is way past the time when the music buying public should have latched on to unique, highly original artists of huge talent such as the Evie Ladin Band. Whilst there are excellent melodies on this recording that uniqueness sets them apart from most bands but without losing sight of the need to entertain, ensuring that this album will in all probability hold something for everyone who hears it. All that's needed now is a way of weaning the masses off 'wallpaper music' and onto albums of real musical substance. This would be a great place to start!